One thing has always fueled the explosive growth of Scientology: spectacular results. And that was the subject of this landmark public lecture series given to standing-room-only crowds at London’s New Lindsey Theatre in October 1955. Over a period of four weekends, L. Ron Hubbard delivered what will forever stand as a classic introductory series on Dianetics and Scientology. 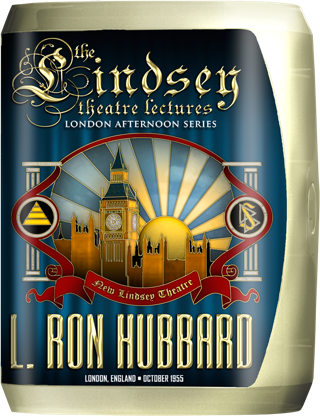 Every lecture is an education in basic Scientology—“The Goals of Dianetics and Scientology,” “Power of Choice and Self-determinism,” “How Good You Can Get” and “The Dynamics,” among others. Now available for the first time as their own series, and invaluable to Scientologists at all levels, these lectures provide a vast array of tools for anyone and everyone to use, and stand as an enduring statement of the goals, principles and application of Scientology across the dynamics. Life doesn’t belong in a textbook. Life doesn’t belong in a university department. Life belongs where it is. And where it is, it’s breathing and living. On 20 September 1955, Mr. Hubbard stepped onto British soil for his first visit in almost three years. It was a moment eagerly anticipated not only by Scientologists, but members of the general public. For the reach for Scientology was increasing to such a degree that even national media were attempting to satisfy public interest by lining up for an exclusive interview with him. L. Ron Hubbard’s response to that demand has since become legendary. For although his plans certainly focused on expanding the ranks of auditors and enhancing their skills through a series of professional training courses that would roll out over the next five months, he was equally dedicated to putting his discoveries and breakthroughs at the service of the broad public. Thus, in a very short time after his arrival, he had scheduled a series of Saturday afternoon public lectures. And over a period of four weekends in October, he delivered what will forever stand as the Classic introductory series on Dianetics and Scientology. “Now, there’s that old one: ‘Do not send to find for whom the bell tolls, it tolls for thee.’ You can say the same thing about the dynamics: Don’t send to find which one is suppressed, it doesn’t matter. If one is suppressed, so will be suppressed the others. They are not independent in their action. They are connected and in confluence, one with another. “You cannot suppress his First Dynamic and make his Third Dynamic survive. It just won’t work. Death—how a person who decides to live without undeciding they are going to die hangs halfway in between, but with Scientology can make up their mind to survive. That many did put it to the test and become happier persons is a fact of history. For if the Lindsey Theatre had been full to the brim, the subsequent demand for these lectures certainly matched that intensity of interest. Indeed, so popular did the series prove that the tapes were immediately copied and made available in the United States and South Africa. While in England, Scientology’s expansion took off at a rate greater than any previously seen in the British Isles. Now available for the first time as their own series, and invaluable to Scientologists at all levels, these lectures stand as an enduring statement of the goals, principles and application of Scientology across the dynamics.